Ninja Turtle Birthday Party: Jackson Is Four! 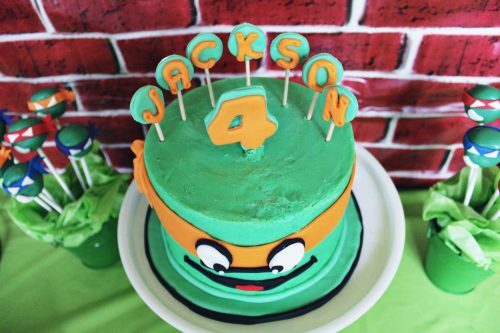 This weekend we had the best time celebrating Jackson’s 4th birthday! 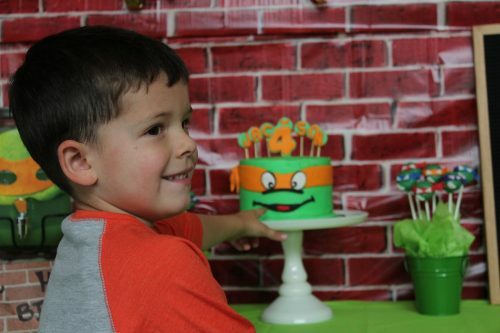 We have always done birthday parties on Saturday afternoons, but since his actual birthday fell on a Friday this year, we decided to go with it. And I loved how it went keeping it more low key! 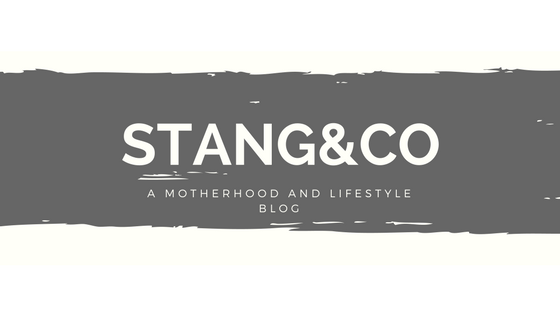 While we love cooking and preparing food, I always think it makes it so hard to focus on decorating and cleaning when you are also making a mess in the kitchen! So we did the ultimate in lazy, and ordered pizza. 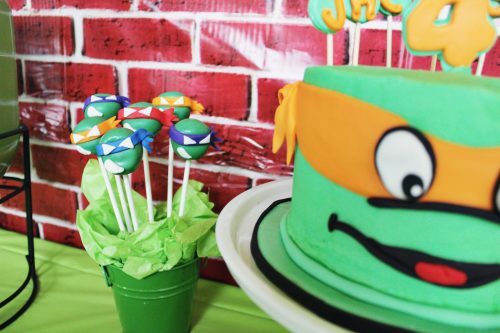 It was, after all, a Ninja Turtle birthday party, and ALL they like to eat is pizza, right!? I placed the order about an hour before we planned to eat, and aside from throwing some chips into a few bowls and picking up the cake, I had NO food to prep. You guys, it was AMAZING. There was also NO clean up. Am I allowed to order pizza from now on for every single party? 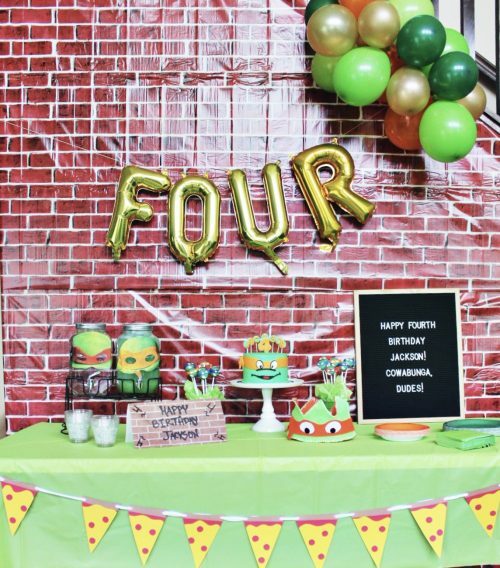 The most labor intensive project for this party was putting up this faux brick wallpaper. I purchased it on Amazon, and it came in a HUGE sheet and was easy to cut. It was almost like a plastic table cloth in terms of feel. I was able to get it to stay on the wall by putting painters tape flat on various spots on the wall, and then placing a piece of duct tape on top of that to get it to stick! I used our wall under the staircase, which is angled. So, I had to cut a few pieces and it got a bit tedious to get them to all match up together. 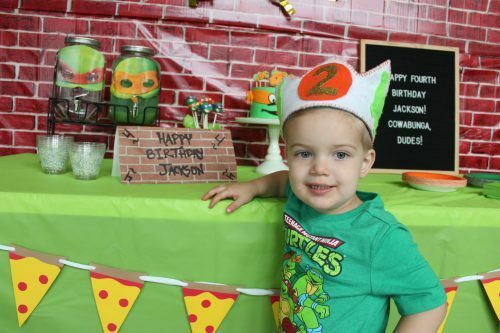 However, it was 100% worth it when Jackson woke up and thanked me up and down for making him a ‘turtle wall’. I will also say that if you put it up on a square wall with no angles, it would be much easier! 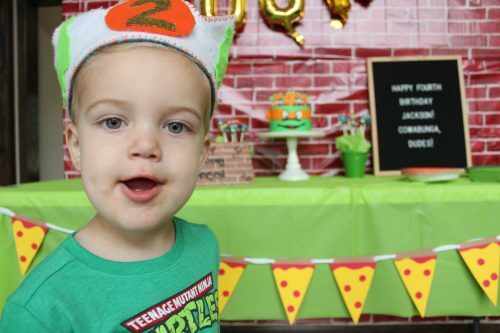 The adorable Pizza Garland was an Etsy find! 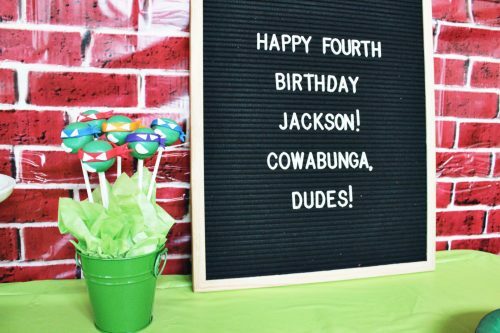 Jackson kept playing with it, which is why it is a bit uneven in some photos 😉 And the FOUR balloons were just individual letter balloons I picked up. They come with little holes on top to put string through so you can spell whatever you want! 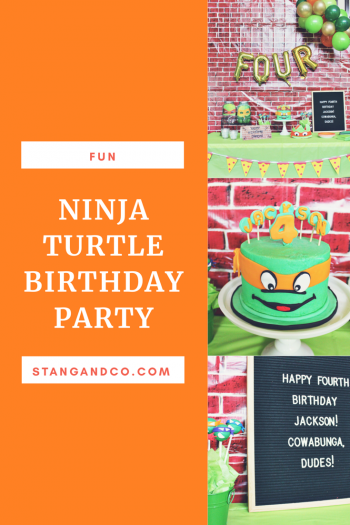 I was honestly pretty relieved when Jackson asked for a ninja turtle birthday party; it is a pretty common theme and I had a LOT of options for decor ideas! 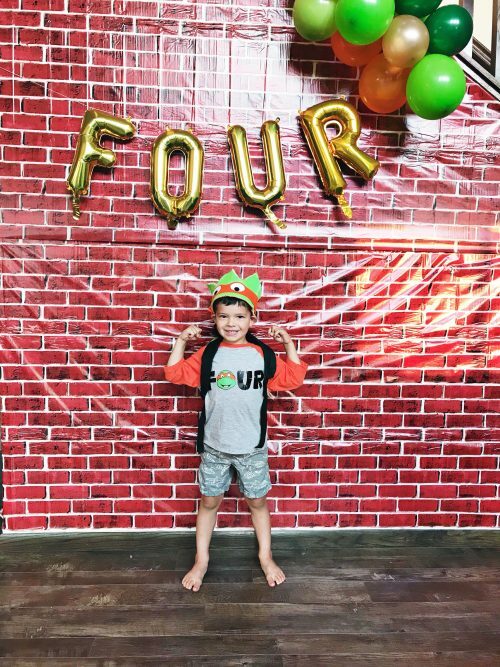 How cute is Jackson’s FOUR shirt!? 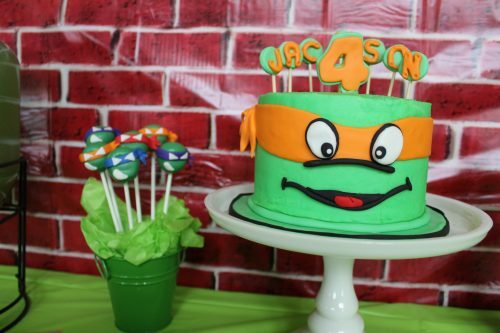 I was able to customize the colors (because he ONLY wanted things with Michelangelo, of course) and I was so thrilled with how this one turned out! 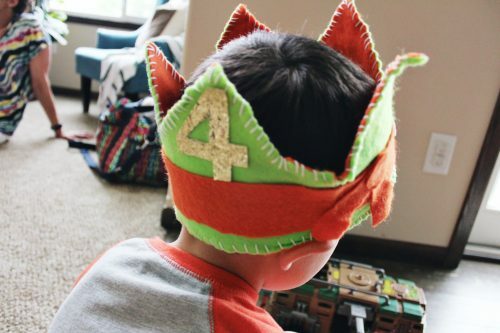 I have started making the boys felt crowns on their birthdays! 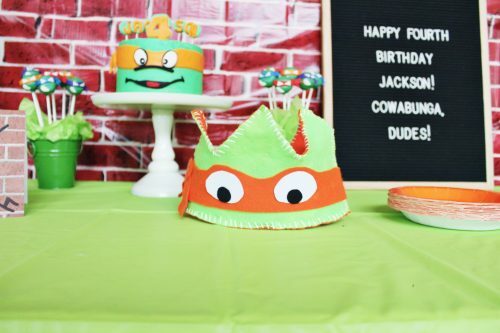 It has been so much fun to make them a crown that is EXACTLY what they want, and the materials to pull these together comes in at less than $5 a piece! I once again grabbed a cake from Little Nuggets Bakery, and decided to try cake pops this time, too! 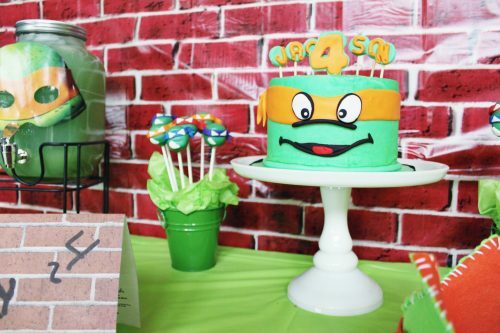 Kimberly is the absolute SWEETEST, and is so gifted at cake decorating! 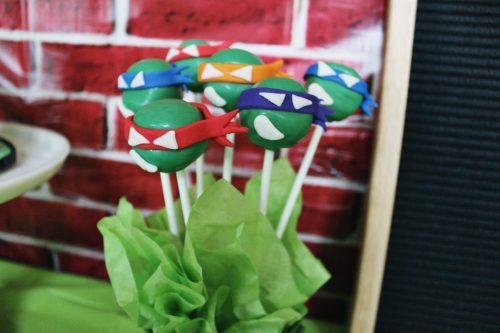 Seriously, how cute are those cake pops!? 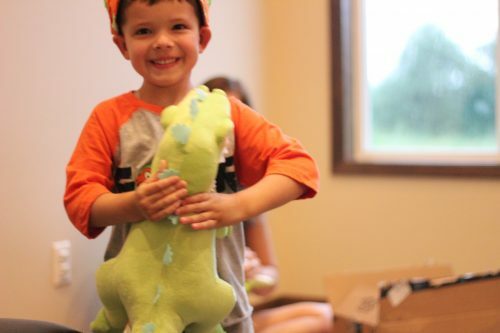 For those of you that grew up on Rugrats, Jackson has discovered REPTAR and I found this stuffed one online! He LOVES it, and I am kind of loving him finding a show I watched as a kid! My favorite letterboard from Mcleod Letter Co! I didn’t get too creative with it, but it is always the most perfect piece to add to bring something extra to a party display! 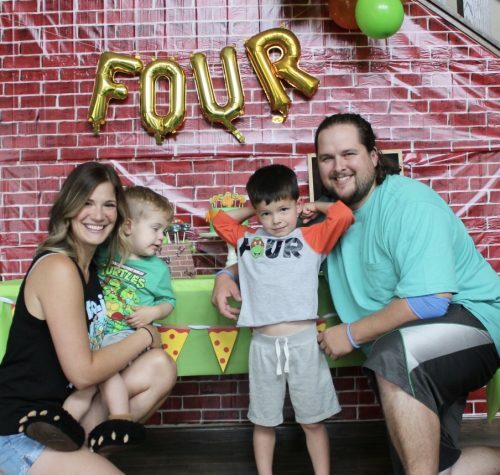 I imagine one day we will capture a family photo with all four of us looking AND smiling, but this was NOT that day. Family photos with toddlers are no joke! These pictures of Lincoln KILLLLLL me. 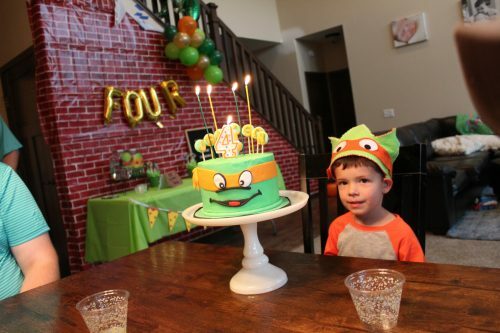 Clearly he did not get the memo that it wasn’t his birthday, but he was too cute to burst his bubble. He went and posed by the table and said cheese, and I had to snap some pictures. 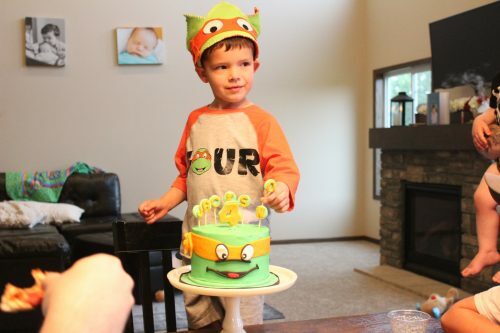 He also insisted on wearing the crown I made for his birthday back in May. Whatever floats your boat, little guy! Once we ate our pizza we sang happy birthday. 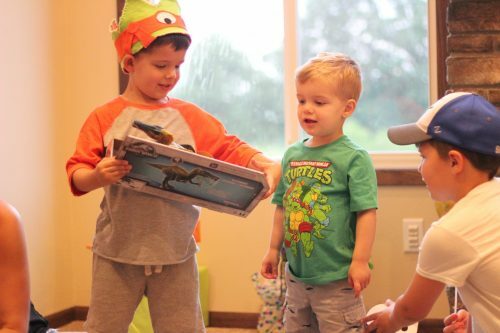 Jackson was SO excited! It has been so much fun this past year seeing how excited he gets over everything. Celebrating babies is great, but they don’t really get it. 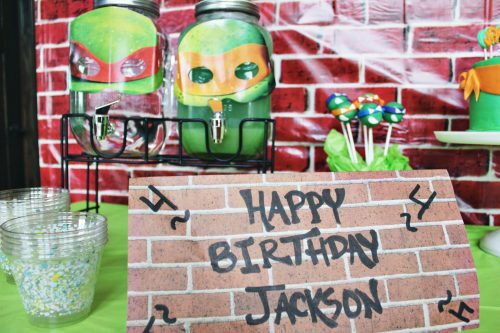 At the age Jackson is now, he understands what is going on and it makes it so much FUN to make things special and magical for him. 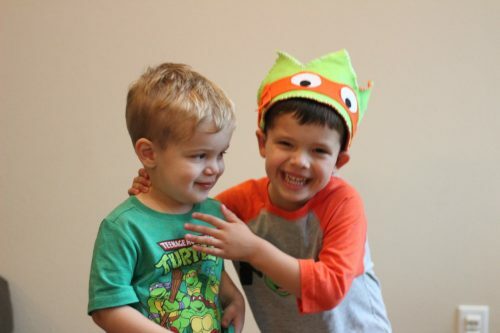 These brothers, melt my heart! 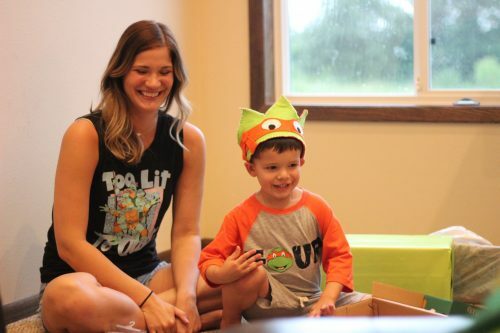 For any ladies in the market for a Ninja Turtles shirt, you can find my tank here! We finished up the night by opening gifts, and called it a night! Like I said, with nothing but cake and pizza boxes, clean up was a breeze and I had ZERO dishes to do! 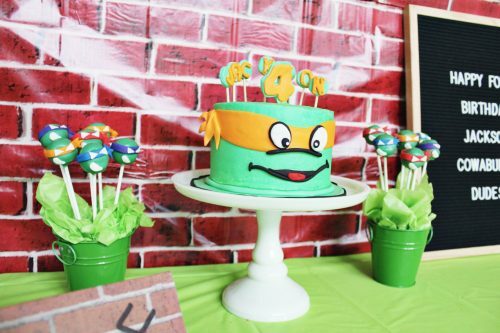 It was such a great day celebrating our sweet, big FOUR year old with his ninja turtle birthday party! 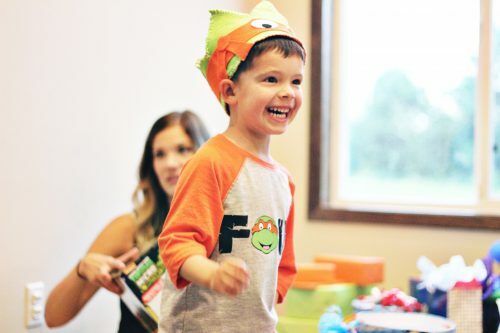 This party is so cute, Mackensey! 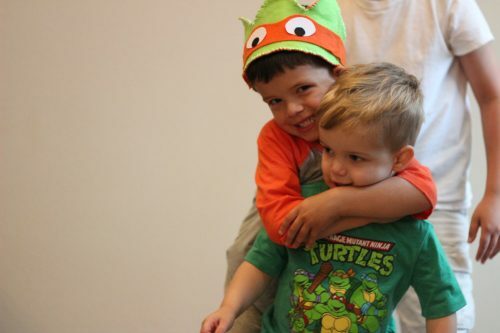 I love how you even had your own Ninja Turtles shirt. And the brick wall looks fabulous! Happy birthday to your sweet boy! 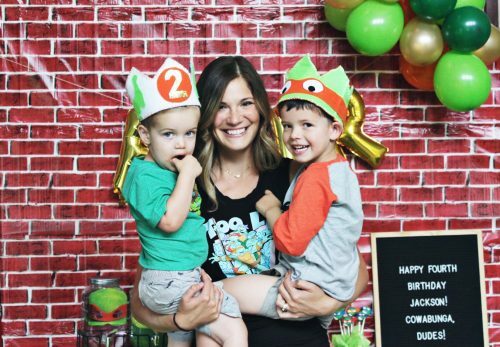 What an adorable birthday party! 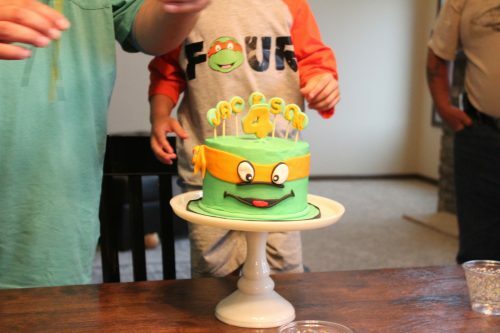 My son had a Ninja Turtle birthday and if I remember correctly it was for his fourth! Love the Four shirt!! You are AMAZING!!! 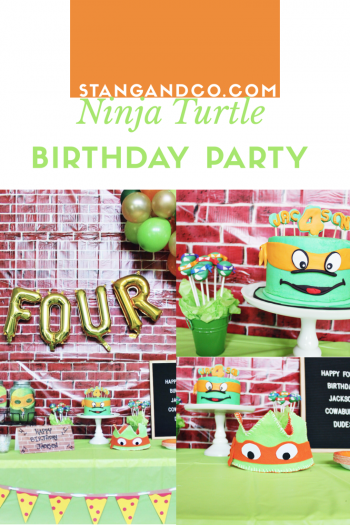 I would have loved this birthday as a kid!